Garth Brooks World Tour with Tricia Yearwood will be stopping in Greenville, SC at the Bon Secours Wellness Arena on Saturday, November 19th at 7:00pm. 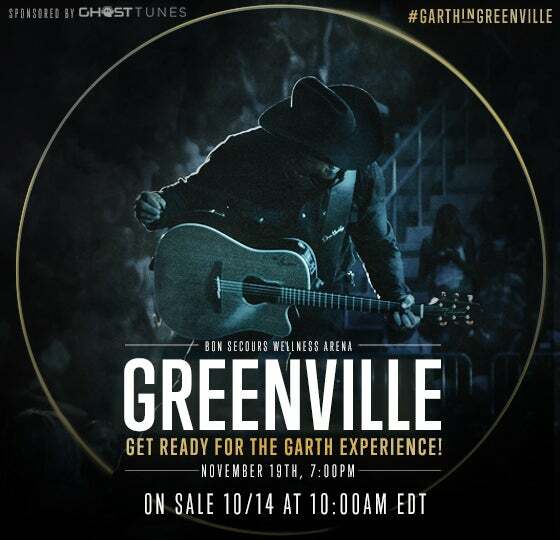 This will be the first time Garth Brooks has played in Greenville in 25 years! Tickets go on sale Friday, October 14th at 10am EDT. There is an 8 ticket limit and tickets can be purchased ONLY at the following: www.ticketmaster.com or ticketmaster.com/garthbrooks or Either Ticketmaster Express 1-866-448-7849 or 1-800-745-3000. *No sales at the venue box office or Ticketmaster outlets October 14th. Tickets may be purchased at the Arena box office and Ticketmaster outlets starting Saturday, October 15 at 10am. Please go NOW to Ticketmaster.com/GarthBrooks and click “On Sale Tips” to create an account or refresh your existing Ticketmaster account for a quicker purchasing experience. Click here for more Ticketmaster tips. The Garth Brooks World Tour Sponsored by GhostTunes.